← How much can a Bullitt bicycle haul? 1 kid, 2 kids, 3 kids, 4! We have four bikes, but only one of them regularly carries two kids. That’s the Bullitt. Our son and daughter go to different schools, and we go to different offices, so as often as not on weekdays, we’re each carrying one kid. 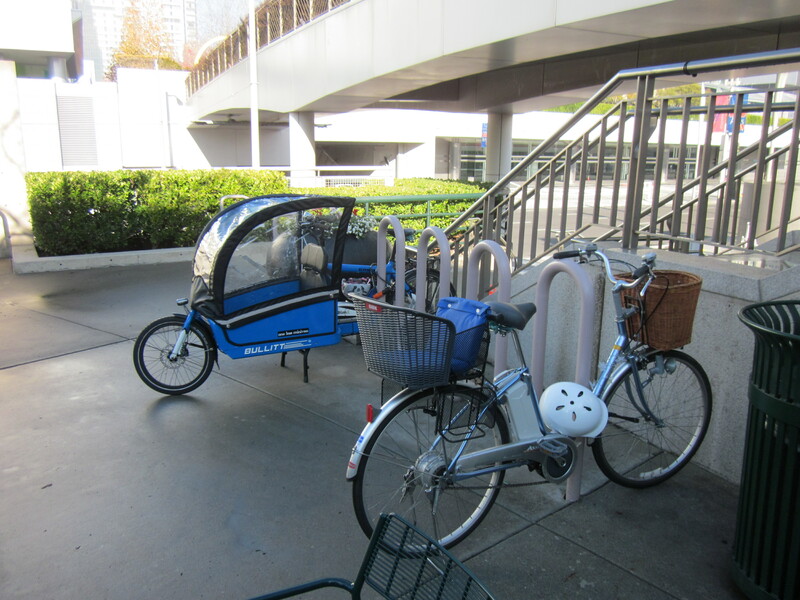 The other three bikes—the Kona MinUte, the mamachari, and the Brompton—can usually carry one kid apiece (although both the MinUte and the Brompton have pinch-hit as two-kid haulers). 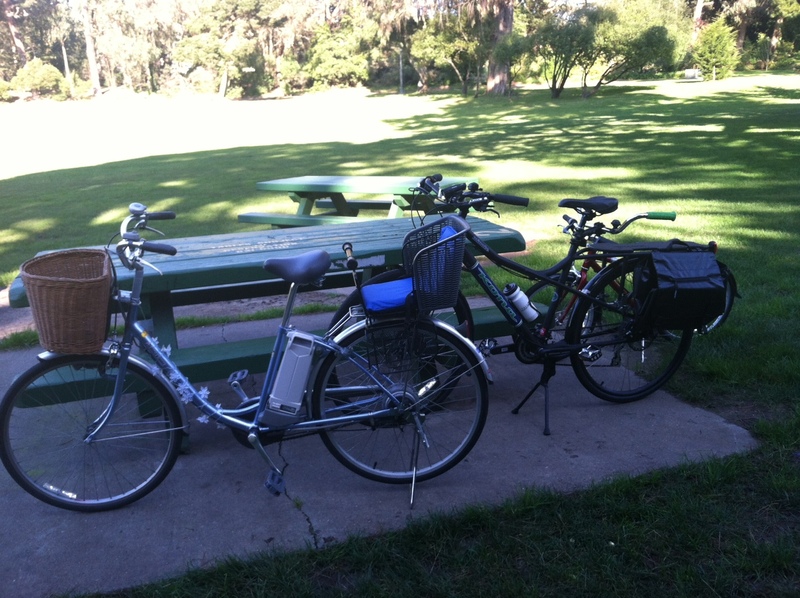 Bullitt and mamachari, better together. If Matt’s on the Bullitt and my route is going to be hilly or long, I’m most often on the mamachari, because it has an assist. Unfortunately it’s also slow and it was, from the start, a cheap bike, so it’s showing its age. 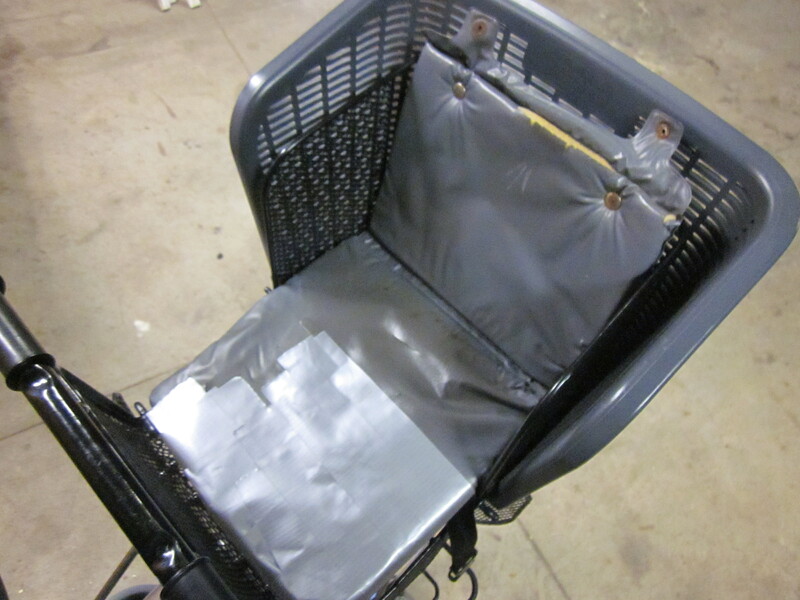 Our kids had been complaining for months that their seat was uncomfortable, which was understandable given that the seat cushion was thin to begin with, and by the time we found it on craigslist it had been mostly ripped to shreds, at which point I’d wrapped it in duct tape. For Christmas I asked Matt to find me a new seat cushion. 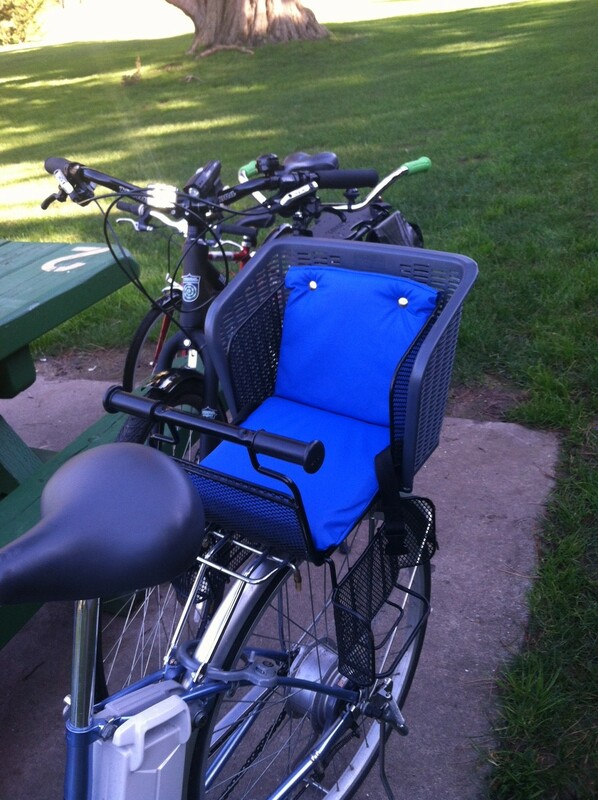 Given that bikes and seats like mine aren’t exactly thick on the ground in the US, this wasn’t the easiest request. At least the duct tape matched the cushion. Matt started his search at cushion stores. They were happy to sell him foam but they couldn’t make a cushion or supply waterproof fabric. But there are countless discount fabric outlets in San Francisco, especially in our part of town, which is like an adjunct Chinatown. He took the kids to one of them to pick out a remnant they liked. Someone, we figured, could surely make a new cushion given these raw ingredients. We briefly considered using my sister’s sewing machine to DIY, but it was the kind of job that required an industrial machine, plus we’d be left with the problem of figuring out how to attach it. How stylish is that? It outclasses the bike. I don’t know where Matt got the insight, but it turns out there is an easy place to get custom bike cushions made. As improbable as it sounds, when he called the local auto upholstery shop they said they could do what we wanted in a couple of days. I guess by comparison to auto upholstery, our needs were pretty simple. It was cheap, too. So I got a new mamachari cushion for Christmas, and now the kids want to ride my bike again. We like it so much (and it cost so much less money than expected) that Matt’s going to have them make a custom cushion for the MinUte now. (Kona hasn’t shown nearly as much interest in family biking as Xtracycle or Yuba, so there is nothing available off-the-shelf.) Happy new year! Matt is jealous of my cushion. The mamachari won’t last forever. It makes occasional disturbing noises now and the mechanics at our local bike shop roll their eyes and laugh when I admit that it’s still rolling along. But I like that I can take it anywhere, even the grungiest parts of town, without worrying about it getting stolen (it’s not very desirable to thieves, but even if they stole it, which is certainly possible, it was cheap enough that I would be sad but not financially devastated). And I don’t have to sweat the hills. It might be ridiculous to have had a custom cushion made for a junker bike, but I’m delighted.